Gathering in Milan to design the future of the Italian techno-stone industry, more than 130 people from business and institutions attended the 2015 Confindustria Marmo-macchine General assembly, held in June this year. It was presided over by Stefano Ghirardi and enriched with fine speeches by Flavio Marabelli, Honorary President in charge of official relations and Roberto Luongo, General Director of ICE the Foreign Trade Agency, the association's annual convention was an event not to be missed for all decision - makers in the sector. During it, in fact, it was possible not only to learn the latest figures for trends in exports to reference markets but also what the association accomplished in the 2014 business year and the projects it has planned for the months to come. Endeavors what will see Confindustria Marmomacchine at more than fifteen international tradeshows alongside Italian companies to provide the support best suited to giving them satisfying event experiences aimed at opening new markets, without forgetting, however that overseeing standards for stone products and the technologies to work them is a task of the association aimed at further strengthening already broad and fully representative membership in it. An ensemble of activities grafted on to the daily work of giving voice to and promoting the sector at all the main institutions, from the Ministries of Economic Development and Foreign Affairs to the ICE Agency. SACE and Simest, from Confindustria to territorial organizations, from Italian fair boards to the foreign. Not to mention the organizations with which the association works daily to further improve the services offered to its more than 312 member companies and best assist them in developing their business. 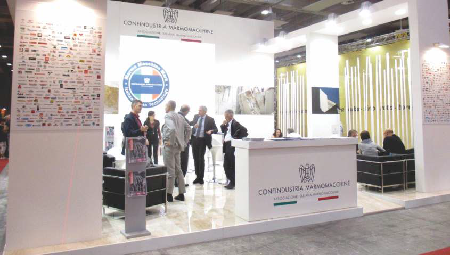 The 2015 Confindustria Marmomacchine general assembly was sponsored again this year by Marmomacc and SACE. It was also the framework for an interesting discussion on "The Stone Industry of the Future" whose participants included Confindustria Marmomacchine and Corrado Franzi, the business manager of Veronafiere, Diego Valsecchi and the head of SACE Giammarco Boccia. Theirs was the important task of giving their audience new visions of the sector's future and the modernization challenges that await member companies and others. Among the tasks more closely concerned with the entire organization and governance of Confindustria Marmomacchine, the assembly formally approved the association's new contributive regulations and elections of the 2015/2017 board of directors, in charge of determining the direction the association will take in the next two years. The world marble-natural stone sector in 2014 continued its growth trend, thereby posting the fifth consecutive increase since the recession in 2009. The total output of materials was in excess of 100 million cubic metres, equivalent to 80.5 million tonnes gross (net of quarry waste) and 1.5 billion square metres of equivalent products at the conventional thickness of 2 cm of marble slabs. The main applications of marble and granite are still flooring, wall cladding and interior decor. The quantity of processed products on the market has increased by more than three times over the last twenty years: today, per capita consumption of marble on a world-wide scale comes to 237 square metres per thousand inhabitants; only Switzerland, Belgium, Saudi Arabia and Taiwan can boast a ratio of one square metre per person. Despite the significant explosion of the stone industry in countries such as Jordan, Oman, Mongolia and Vietnam, the future production will be increasingly concentrated in a handful of countries headed by China, followed by India, Turkey, Brazil, Italy and Spain. All these together account for more than 70% of total volumes. In terms of international trade, global export volumes came to 56.9 million tonnes (+6.73%), of which 29.5 million tonnes for raw materials (+5%) and 27.4 million tonnes for processed materials (+8.7%). In the last two decades, the flow of world exports has almost quadrupled. The global stone trading turnover in 2014 was about 23 billion dollars, of which 75% generated by processed products. In terms of export turnover, the top four countries in order are: China, Italy, Turkey and India, followed by Brazil, Spain and Portugal. As regards imports, China still ranks first as regards purchases of raw material, followed by Taiwan, while finished products are especially imported by the United States, Canada, Germany, France, Belgium, South Korea and Saudi Arabia. The World Stone Report, presented in Marmomacc, Verona, has for 26 years been an authentic reference landmark for all professionals in the sector. This year a historic record with 110 countries monitored was set up with more than 24 thousand economic and statistical entries, based on Eurostat, ComTrade and Abi Rochas sources. It is hoped that the quantities of world turnover and export shall increase substantially in 2015.